A few years back, Two Birds set free Piña Colada IPA into the world, an IPA that bridged the world of beer and cocktails by matching some of fruitiest, tropical flavoured hops with pineapple and coconut. 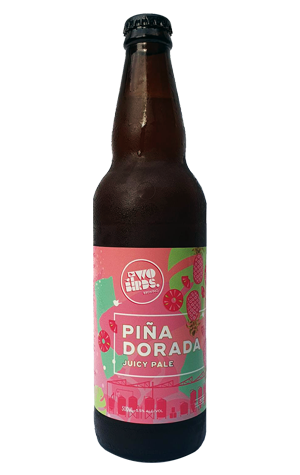 Here, with Piña Dorada, the Two Birds brewers appear intent to create that beer, albeit in a slightly more restrained form. For one, it’s one labelled as a juicy pale rather than an IPA. And, rather than heavy fruit additions, the beer relies on a combination of El Dorado, Galaxy, Ekuanot and Citra to make it a hazy pale that's big on the tropical fruit. Largely, they've taken things on a pineapple bent, but there’s some melon and citrus in the mix too, in a beer that delivers a slight prickle as it goes down.